We all know the days from date calendar are changed by the month or the year. A month is not always 30 days. It can be 30, 31, 28 and 29 days. The average days in 48 months are 30.4375 day. And days from date calendar in a year is 365 days (common years) or 366 days (leap years), and every four year there will be a leap year, so the average days in a year may be 365.25 days. If you are a team leader working a project, you want a exactly time duration calculation to record how much time you have spent in this project, you have record it in a number like 4.52 year (a year number with decimal place). There is a time calculation to tell you the day’s number you want know. So you don’t have to worry about it anymore. So, you have install and run the time duration calculation, you want know the exact days you have spent in the project, you can input 4.52 in the years , the number of days will be show immediately is 1,650.9 days. You can also know about the months or the weeks you spent on the interface is 54.24 months or 235.8 weeks. The time calculator for hours can tell you the hours you spent are 39,622.3. By recording these numbers, you can compare your working efficiency by your working hours. 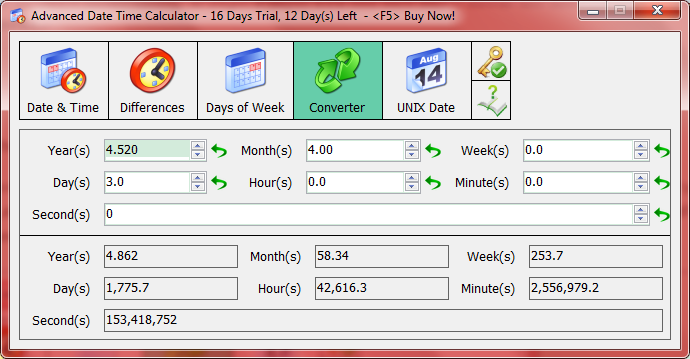 Click here to get the time calculator for hours software! The time calculation can also do some other things for you when you deal with time caculate problems. Like you have met your boyfriend or your girlfriend like 1year, 4 months and 3 days, and you want know the hours you two have meet each other. With the time calculator for hours, you only need to input the days from date calendar in the corresponding blank, than your answer is out like 11,760 hours. You can tell him /her with this number. How romantic! There are more functions in this time calculator for hours /years, you caculate the difference between two times and more function waitng for your try. You can get Advanced Date Time Calculator by the following button. 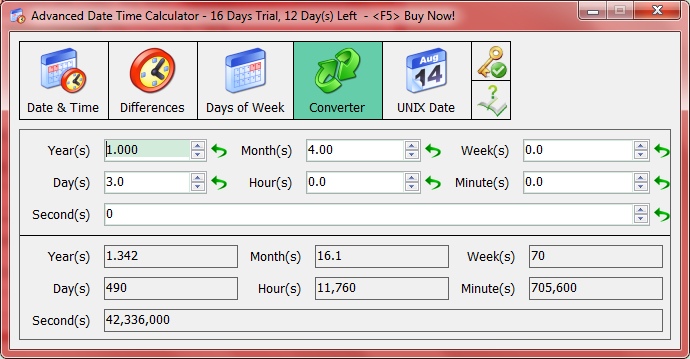 Free Download Advanced Date Time Calculator Now!